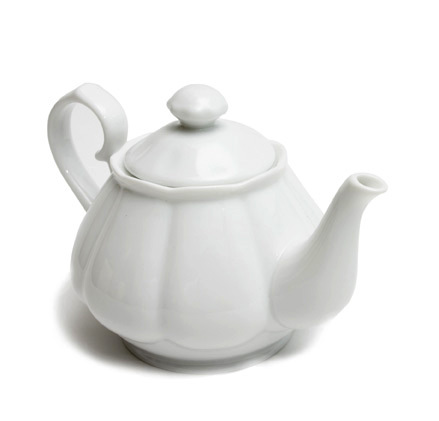 This porcelain teapot is perfect for brewing tea. It is part of the Diana Collection. It has an internal filter at the base on the spout. Place 2 teaspoons of tea in the teapot, pour boiling water, wait 3 minutes and serve. Approximate Capacity: 500ml (17 fl oz).  Click here for matching tin canister.  Click here for matching teapot warmer. This was purchased for a gift, and I am glad I did. It is very elegant and is a perfect size for serving "tea from the pot." Thank you for having this product available. Beautiful little teapot for a reasonable price. Great teapot. Looks great and holds about 2 cups of tea. Since I add a bit of milk it lasts for a few more cups. Wish it was a bit bigger but for just a few cups it's great!